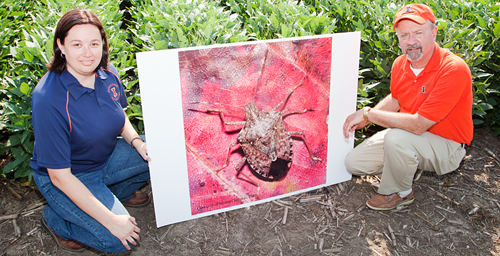 Pest patrol Kelly Estes, state survey coordinator at the Illinois Cooperative Agricultural Pest Survey, and Michael Gray, a professor of crop sciences, are urging Illinois farmers to be especially vigilant about scouting their fields for brown marmorated stink bugs. CHAMPAIGN, Ill. - The brown marmorated stink bug - scientific name Halyomorpha halys - has been found in four Illinois counties and could be a major threat to fruit, vegetable and agronomic crops if it proliferates. First detected in Cook County last fall, several brown marmorated stink bugs were found in moving boxes by a Kane County homeowner in January. Residents in Champaign and McLean counties found single specimens in May, said Kelly Estes, state survey coordinator with the Illinois Cooperative Agricultural Pest Survey Program at the University of Illinois. "We're really just starting to find them in Illinois," Estes said. "Detection is key. We want to monitor where they're at so we can determine if populations are getting large." Native to China, Japan, Korea and Taiwan, the brown marmorated stink bug was first detected in the U.S. in Allentown, Pa., in 1998. Since then, the bug has migrated to 33 states, including all states east of the Mississippi River, and has been seen as far north as Wisconsin and Minnesota and as far west as California and Oregon. The voracious insect feeds on more than 300 crops, including fruits, berries soybeans, corn, cotton, ornamentals and woody trees. Unlike many other insects, however, the brown marmorated stink bug feeds all through the growing season. The bugs use their piercing and sucking mouthparts to penetrate immature soybean pods and corn husks and feed on developing seeds and corn kernels. Sunken, discolored areas on fruit, with corky areas beneath the skin, may indicate that brown marmorated stink bugs have been feeding. With no natural predators in the U.S. and a tolerance for insecticides, the brown marmorated stink bug poses significant management challenges for farmers. In the mid-Atlantic states, populations of the insects have grown explosively over the past several years, causing "serious economic injury to the peach, apple and Asian pear" crops during 2009, and the bugs ruined about half of Pennsylvania's peach crop last year. Pyrethroids - synthetic insecticides that are chemically similar to naturally occurring insecticides derived from chrysanthemums - have been used, but results have been mixed, said Michael Gray, a professor of crop sciences and an assistant dean in the College of Agricultural, Consumer and Environmental Sciences at Illinois. "In many cases, the necessary residual activity and effectiveness have been lacking, requiring additional treatments," Gray said. "In some instances, use of older chemistries, such as organophosphate insecticides, has resulted in better control. There are obvious tradeoffs, including potential negative environmental consequences and human health and safety concerns with the use of organophosphates." The bugs pose no danger to humans, other than emitting a foul odor when crushed or sucked up by a vacuum cleaner. Caulking around baseboards, light fixtures and trim may prevent the bugs entering through basements, drop ceilings and attics. "More than likely, homeowners will be the ones to find them," Estes said. "As crops and plants start to turn brown in the fall, these insects are going to look for a place to over-winter, and they'll move into houses, garages and barns and just become a real pain to homeowners." Although the brown marmorated stink bugs are very similar to the brown stink bugs (Euschistus servus) already found in Illinois, Estes said the brown marmorated bugs are slightly larger; about two-thirds of an inch long; have bodies that are mottled brown and shaped like shields; black and white bands on the edges of their abdomens; white stripes on their antennae; and faint white banding on their legs. 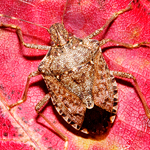 Farmers are urged to be especially vigilant this season scouting out stink bug species, including the redshouldered (Thyanta custator Fabricius) and the redbanded (Piezodorus guildinii Westwood) stink bugs. Redbanded stink bug populations have been found in several states, including Arkansas, Missouri and Tennessee, with economic infestations reported in Louisiana. So far, there has been no official confirmation that either of these species has migrated to Illinois. "We're always looking for them," Estes said. "If somebody thinks they have one, they are more than welcome to send me a photo or even a specimen to look at. I've received several (specimens) this summer, but none of them have been brown marmorated stink bugs, thank goodness." Specimens, in crush-proof containers such as pill bottles and check boxes, can be sent to Estes at the Illinois Cooperative Agriculture Pest Survey, 1816 S. Oak St., Champaign, IL 61820. Email photos to kcook8@illinois.edu for preliminary screening. Editor's note: To contact Kelly Estes, call 217-333-1005 or e-mail kcook8@illinois.edu.